Ho Hum, another racing season ends this weekend, which I really haven't paid much Attenzione to this year, since I cannot even remember the last IMSA Weathertech SportsCar Championship event I watched/listened to? Although Me Thinks I caught the majority of the Bubba Burgers round at Long Beach Wayback on April 14th. Although it's funny thinking how a year ago the BUZZ' in IMSA's Paddock was over whether or not El Capitano', nee Roger Penske & Co. would be entering the Petit Le Mans as a Tune-up for this year's Full Season Assault as the "Factory" two car Acura Daytona Prototype International (DPi_ squad, with its two biggest Stars being HULIO', aka Helio Castroneves and JPM', Monty or just plain 'Ol Juan Montoya as some call him. As this year's theme is Diversity, having noticed a total of six different Overall winners of the top flight (DPi) Prototype class prior to the penultimate round at Laguna Seca, Sept 9th. As I enjoyed listening to Colin Brown's interview with Speed Freaks after notching his and Cor Autosports second consecutive victory at Road America Wayback on August 5th. As the Mustang Sally; Err Sampling Caddy' won this year's Rolex 24, with JB', nee João Barbosa and Christian Fittipaldi collecting Thar third Rolex wristwatch apiece, with Barbosa's Countryman Filipe Albuquerque ARSE-Sumedly scoring his maiden Rolex 24 victory. Continuing in Florida on two of its revered racetracks, one of Scotty Sharp's Extreme Speed Motorsports Nissan's; Uhm, the No. 22 Onroak Nissan powered turbocharged chassis won the prestigious 12 Hours of Sebring with Luís Felipe "Pipo" Derani, Nicolas Lapierre and Johannes van Overbeek at its controls. Long Beach, the season's first "Sprint" race saw the No. 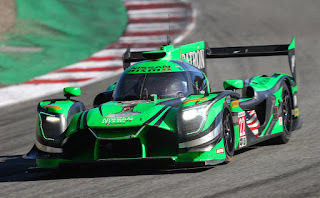 5 Action Express Racing's (AXR) Cadillac DPi victorious again, albeit Christian Fittipaldi's only running the endurance rounds this year, before retiring after next year's Daytona 24hrs event. Whilst it's Seester' AXR No. 31 Welland Engineering with Eric Curren and Felipe Nasr at its keyboard claimed the W' at Belle Isle. Netting the Brazilian Nasr, a former Formula 1 Pilote' his first Sports Car W'. Acura Team Penske scored its maiden Weathertech Sportscar Championship win at Mid Ohio, where the #6 with Castroneves and Ricky Taylor claimed the podium's top step. As JDC Miller Motorsports scored a popular victory with its #99 sporting "Red Dragon" colours at the Six Hours of The Glen race. While the aforementioned Colin Brown and his co-driver John Bennett won at Mosport and Road America aboard their #54 Cor Autosports entry, with both teams utilizing the Oreca 07 LMP2 chassis. Although perhaps the LMP2 Spec machinery was doing too good? Since IMSA gave them a 10-kilo weight increase, plus decreased their fuel tank allowance afterwards, prior to the Laguna Seca round. Hence Laguna Seca served as a virtual rubber Match with the Cadillac's v Oreca's, ironically both propelled by normally aspirated V-8's having won three races apiece. And in a race of Coulda-Woulda-Shouldas' at Laguna Seca, you cannot fault Johannes van Overbeek and Pipo Derani taking full advantage over their fellow competitors mistakes to notch Nissan and Extreme Speed Motorsports (ESM) their second victory of the year.